This chair is stylish and smart, with a lightweight steel frame and a moulded plastic seat and back. This compact chair is completely foldable and is a perfect choice for those looking for practical seating for events. They can be easily stacked out of the way to create extra space. 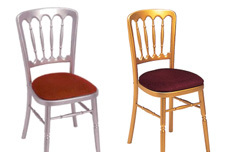 Our banquet chairs are solid pieces of furniture finished off with a cushioned seating pad available in various colours. These chairs grace any event perfectly giving a very elegant look. The Limewash Chiavari chair is by far our most popular, perfect for all events from parties to Weddings.